Cornell has a history of hiring faculty with strengths and interests in German, not only within the Department of German Studies, but throughout the university. So, 25 years ago, Professor Peter Uwe Hohendahl set about creating an institute that could bring faculty from across campus with interests in German together for conferences and colloquia to share ideas, opinions and research. “We have always had considerable strengths in German studies across many departments,” Hohendahl said. From music, art history and performing and media arts to philosophy, anthropology and sociology, faculty are teaching and researching on topics rooted in German culture. But faculty rarely worked together before the institute was established, except on hiring committees, he said. The institute began its work in 1992 by organizing yearly conferences and bi-weekly lectures, readings and colloquia, which offer graduate students or faculty the opportunity to present papers and receive critiques. These colloquia are somewhat famous among many past graduate students as a place to refine your presentation, negotiation and questioning skills. “The colloquium taught me how to be a good colleague with an omnivorous range of interests, and how to foster intellectual community,” said Paul Buchholz, MA ’09, PhD ’10, now assistant professor in the Department of German Studies at Emory University. “I can honestly say that there is no better venue for presenting and discussing new scholarship in our field. Hohendahl said the colloquia’s format allows for a short presentation by the paper’s author, then sometimes as much as two hours of discussion, unlike a traditional paper presentation. 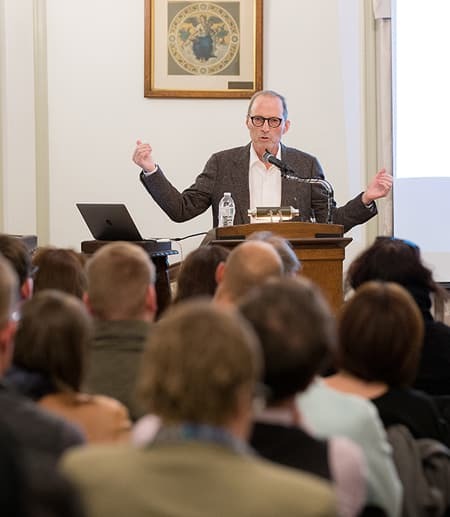 “Other major German departments don't tend to have this sort of regular event that brings together the students and faculty from the department and from the outside, to have what is ultimately a dialogue about the future of our field,” Buchholz said. Hohendahl said outside presenters often say how impressed they are by how well Cornell students have read their papers and prepared for the discussion. Two of the most memorable conferences during the first 25 years of the institute were a 2001 event focused on public culture in Hamburg from late 17th century to early 20th century and a 2014 series on critical theory and post Colonialism done in collaboration with Natalie Melas and the Institute for Comparative Modernities. The series on critical theory and post Colonialism series of workshops “put the critical theoretical tradition of German in the center of the most contemporary pressing global debates,” Fleming said. The institute also brings leading artists from Germany, Austria, and Switzerland to campus for extended stays as artists-in-residence. That artist-in-residence program, begun in 2003, allows artists to present their own work, conduct seminars on related subjects, and interact with students and other members of the Cornell community. Both former directors say the institute’s size and small budget are sometimes a challenge, but also a benefit. “Institutes can be nimble and fast and much more innovative than departments,” Hohendahl said. “If things work, we can run with them,” Fleming said. In the last five years, the institute has added an exchange program for students with the University of Cologne , including summer school opportunities for undergraduates, as well as enhanced faculty and graduate student collaboration with the Humboldt University, Berlin, via its PhD Network. The institute also supports graduate students who attend the Boulder German Studies Summer Colloquium in Colorado. In thinking about the next 25 years, Hohendahl said increased funding would allow the institute to bring in more visiting artists and filmmakers, or begin a new book fellowship program for a young author who will be publishing with “Signale: Modern German Letters, Cultures, and Thought,” a book series edited by Hohendahl in cooperation with Cornell University Press and Cornell University Library. The fellowship would allow an author to finish their work and graduate students the chance to learn about finalizing a manuscript.